I was just on a padcast show called G220 Radio. The name comes from Galatians 2:20. You should look that verse up, here. The show is hosted by Ricky Gantz. He has followed the Contradict – They Can’t All Be True Facebook page for quite awhile. He recently launched this podcast and he has a lot of great topics that I think anyone who likes this blog would be interested in hearing discussed. The show before the Contradict episode was on Jehovah’s Witnesses and the show that will be aired next week is on interracial relationships and marriages – you know from the Bible. I hope they address the insane idea that dark skinned people came from the descendents of Ham, because Ham was cursed to have children born to slavery. If you want to see where people get that idea, go to Genesis 9. For the G220 Radio episode I was on as the guest, I love that Ricky focused on Chapter 2 of Contradict – They Can’t All Be True. Chapter 2 teaches the basic history, beliefs, and practices of the world’s five major religions via 20 key terms for each. So 100 terms in total. 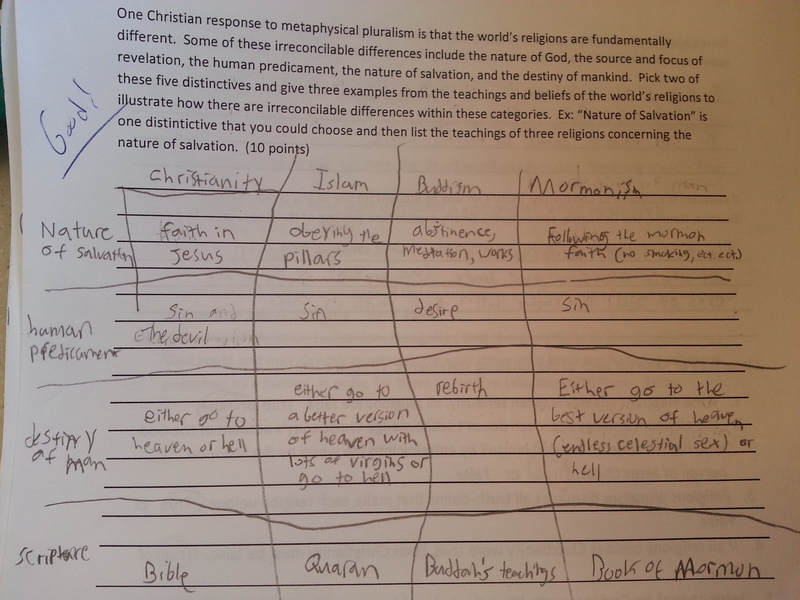 Ricky went through each of the five religions and asked me to speak on some of those terms for each religion. I like that he did this because I took it upon myself to compare and contrast the teachings with what the Bible teaches us. I also was able to give some good points for where the Gospel could be interjected into the teachings of other religions – in other words points at which adherents of these other religions would find the Gospel to be truly Good News for them! Ricky also got to share some experiences he has had using Contradict in evangelism. Give it a listen and share it far and wide. G220 Radio: Contradict They Can’t All Be True! Alan opens the letter by saying that most Muslims would say yes. That’s not my experience… I have yet to meet a Muslim who has said yes. They have always told me that Christians worship three gods, not one! I also don’t agree with part of his conclusion in the letter. I think if Jesus were to show up on the streets of Detroit today, every Muslim would fall in worship – they’d have no choice at Christ’s second coming – Every knee shall bow and every tongue confess that Jesus Christ is Lord! Philippians 2 says this. But I get Alan’s point. If Jesus were to somehow return a second time in his state of humiliation and not his exaltation, Muslims wouldn’t bow and worship him, unless they converted to Trinitarian worship. With that said however, Alan does a great job in my opinion of showing how Muslims believe in a God that is one person, one essence. Christians believe in a god that is three persons, one essence. Big distinction! I like to say, “Jesus is God or Jesus is just a man.” Clearly, we’re not worshiping the same God. But from my experience, many Christians simply don’t fathom this. I have seen classrooms filled with mostly Christians divided on this question, just like Alan said. Why? Why are Christians divided on this issue? Reza Aslan’s Interview on Fox and his new book Zealot! The interviewer is slammed for asking him again and again why he is writing this book as a Muslim. I think Reza’s answers could have been much better, but the interviewer just keeps asking the same question again and again and it gets nowhere and we don’t get to learn much of what Reza actually believes concerning the life of Jesus. What stood out the most to me in the interview is that Reza states that it is a fundamental truth that everyone agrees that Jesus was crucified, but that’s not the Muslim belief and teaching of Islam as he also states! Reza must mean that every historian believes Jesus was crucified. This leads me to believe that Reza is a very liberal Muslim. It even makes me think that he isn’t Muslim at all to so openly deny a teaching of the Qur’an like this. However, I was told that there were different Muslim interpretations on this passage. I however don’t think that Jesus actually being crucified was one of them. Some Muslim scholars believe that Jesus never died and others believe that he died of natural causes, but which Muslim scholar besides Reza believes that Jesus was crucified. It appears as if Reza has an interpretation which does not fit with the interpretations of mainstream Muslim scholars on the teachings of the Qur’an and the Hadiths, so I’m very interested to read his book to see where else he skews not only on orthodox Islam but also Christianity. I wish the interviewer allowed him to get into such things, but it would have been nice if he had answered her question in a better fashion by just saying, “As a Muslim, I’m very deeply concerned with and interested in the person and history of Jesus (peace be upon him) because there is more in the Qur’an about Jesus (peace be upon him) than Muhammad (peace be upon him) and since the teachings of Christianity contradict the teachings in the Qur’an I have every right and interest as a religious scholar, Muslim, or any person interested in seeking religious and historical truth to research the life of Jesus.” I think if he had answered in such a way it would have shut down her stupid string of questions. She clearly is very ignorant on the subject of religious studies and the desire that any religious adherent should have in researching the claims of religions other than their own. If Reza and other Muslim scholars are beginning to say that Jesus was crucified then it seems like a direct leave from the direct statements of Sura 4:157-158. I see where there is room for Jesus to have died a natural death in that passage, but there is clearly no room given for him to have died by crucifixion. I have never met a Muslim who has read the Qur’an to say that Jesus died of natural causes, much less that he was crucified, and these were leaders of Muslim unions on college campuses and teachers from whyislam.org who I invited to my world religions class to speak. You can check out their website and they very clearly state that Jesus did not die! (http://www.whyislam.org/submission/prophethood-in-islam/jesus-peace-be-upon-him/jesus/) They leave no room for any other interpretation. I’m afraid to say that Reza doesn’t seem very reliable as a Muslim theologian. How do religions contradict each other? If someone says that all religions have the same teachings, and same basic principles, and you share that this is not the case; religions contradict each other in ways that are irreconcilable to anyone who is an orthodox adherent to their religion of choice. To be able to back up your assertion, simply have memorized a few doctrinal categories and several of the world’s religions’ positions for each of those categories. Spitting out a few examples of what different religions teach, say, in the categories of who God is, what the source and focus of revelation is, and what lies after this life, should be enough to demonstrate some very stark contrasts in beliefs. Clearly, all religions don’t teach the same views on life, God, and the destiny of mankind, but can you quickly demonstrate it? Muslims believe Jesus is the Messiah – Clash with John 14:6. Did you know that Muslims believe Jesus is the Messiah? Where does that fit into John 14:6? See you can’t speak for all Muslims. Some do believe Jesus is the Messiah, others believe he was just a prophet who died, etc. What does the word Messiah mean to Muslims? I think that was a pretty good response. Ask the guy for more clarity. Do all Muslims believe Jesus was the Messiah? They likely refer to him as the Christ, but do they know that Christ means Messiah, and if they do know this, what exactly does the word Messiah mean to Muslims? Do they have Messianic expectations that are the same as the Jews? Do they understand Jesus’ role as the Messiah in the same way as Christians? I know that you are right that Muslims believe that Jesus was born of a virgin named Mary. I also know that they don’t believe he died. That is clearly stated in the Qur’an. If he did not die, then the doctrine of his atoning sacrifice for the sins of mankind is not within Islam, which means that Muslims reject the prophesies of Isaiah 53. Muslims believe that each man must pay for his own sin, that they cannot stick their sins to someone else. This means Christians have quite a different understanding of who Jesus is and what he did for mankind than Muslims do. The following page shows the verses from the Qur’an that support that Jesus was born of a virgin, did not have an earthly Father just as Adam, and did not die:http://www.islam-guide.com/ch3-10.htm. Help me out, please. Where do you find that Muslims believe that Jesus is sitting at the right hand of the Father and that he is the Messiah. Also show me what Muslims believe concerning the Messiah. I know that Christians recognize that Messiah means “anointed one” and that prophets, priests, and kings were anointed in ancient Israel. Christians believe that Jesus as the Messiah fulfills all three offices in such a way that no other person possibly can because Jesus is fully God and fully man (another Doctrine that Muslims reject). Any feedback or additional thoughts or answers to the questions I left in my post on this topic would be appreciated.